Our PACES courses have been held regularly at Guys Campus in London. These courses will have the identical format and involve the same lecturers and patients as the courses held at the Guys' Campus. 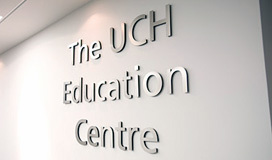 The University College Hospital Education Centre, described as 'The UKs most advanced training facility for healthcare professionals', is conveniently located next to Euston Square and Warren Street Underground stations and a few minutes walk from Euston British Rail station.